Travelpro's Crew 11 makes travel easier than ever. This versatile 14-piece collection of Spinner and Rollaboard luggage is packed with innovations - MagnaTrac self-aligning wheels, PowerScope Extension Handle, Contour Grip and Duraflex anti-break buckles. Plus, an integrated USB Port on select Carry-ons helps you power up phones or tablets on the move. With 10 Carry-ons, this stylish collection is designed for today's frequent travelers who put a premium on design excellence, quality and durability. Backed by the Travelpro Lifetime Warranty, Crew 11 is built to last. For over 25 years, Travelpro International has prided itself on design innovation and durability in crafting the highest quality luggage for travelers worldwide. 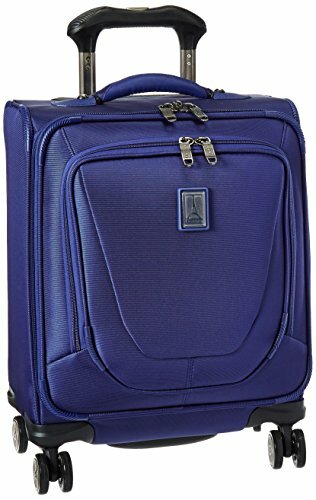 Since transforming the ease of modern day travel with The Original Rollaboard wheeled luggage, Travelpro has been the brand of choice for flight crews and frequent travelers on every continent. Patented Contour Grip, with cushioned touch points, fits perfectly in your hand to offer even more comfort and greater control of Spinner luggage. Patented PowerScope extension handle reduces wobble and features stops at 38", 40" and 42.5" to ensure a comfortable roll for users of different heights.